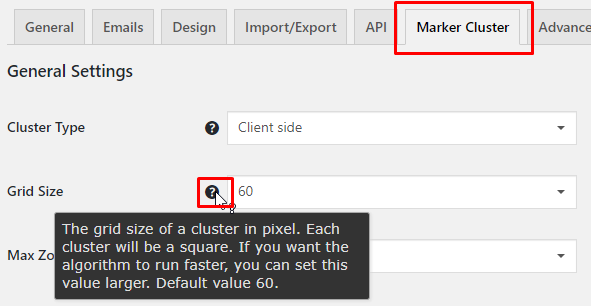 The marker cluster addon improves map and site performance by clustering markers from nearby locations. The single ‘marker cluster’ represents several locations at once, and clicking the cluster zooms in and expands the individual markers. Check to be sure you have the following plugins installed before you get started. Download the Addon from your account. Server side rendering can be used to improve performance of GD Home Maps created with widgets and shortcodes. The grid size of a cluster in pixel. Each cluster will be a square. If you want the algorithm to run faster, you can set this value larger. The max zoom level monitored by a marker cluster. When maxZoom is reached or exceeded all markers will be shown without cluster. Map widgets shortcodes and blocks will have an extra option to cluster the map.